Sphenacodon was a pelycosaur (a type of mammal-like reptile) that lived during the early Permian period, perhaps around 280 million years ago. Fossils of the animal have so far been found in Mexico and Texas. 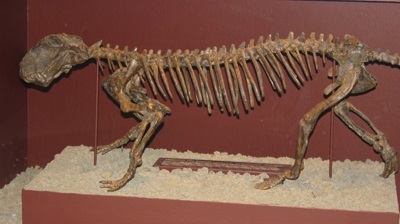 Sphenacodon was a carnivore, and was about 10 feet (3 meters) in length. Although it was closely related to Dimetrodon, Sphenacodon did not however have a sail.